A still from Traidcraft’s Just Friday campaign video. November was a big month in media, from the American election, fake news and “post-truth” politics to the annual Black Friday frenzy. There is always something you can learn from observing how different organisations approach topical issues, so here are a few things I’ve learned in the past month. I wasn’t impressed with the stream of Black Friday themed emails from ebay, and I was particularly unimpressed with the one that came with the subject line: “It’s Black Friday, Penny. Act Accordingly.” My friends were equally unimpressed: yes, I did share it on social media. This shows, perhaps, that a global business needs to be more culturally sensitive, because despite the retail industry’s best efforts many UK consumers still resist this American import. 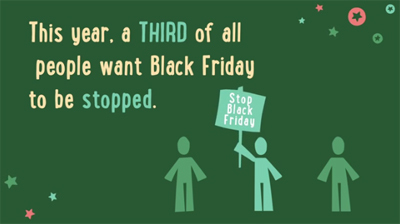 What I did like, though, was seeing organisations whose values I share subverting the Black Friday message. 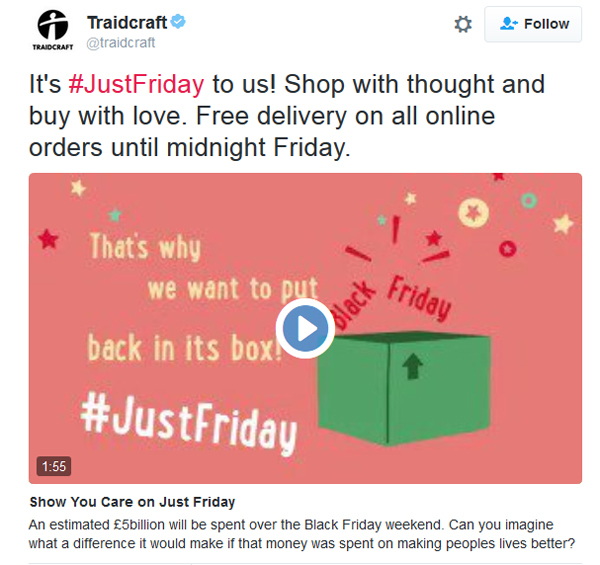 UK-based fair trade organisation Traidcraft rebranded the day as “Just Friday”. The campaign still encouraged shopping, but as a way to “Show You Care”. The arts, faith and justice festival Greenbelt announced they were closing their box office for the day. The next festival isn’t until August, so it’s unlikely to make a difference to sales, but as a gesture it’s worth a lot of goodwill among supporters. The shopping “festival” continued with Cyber Monday (where we are encouraged to buy online). 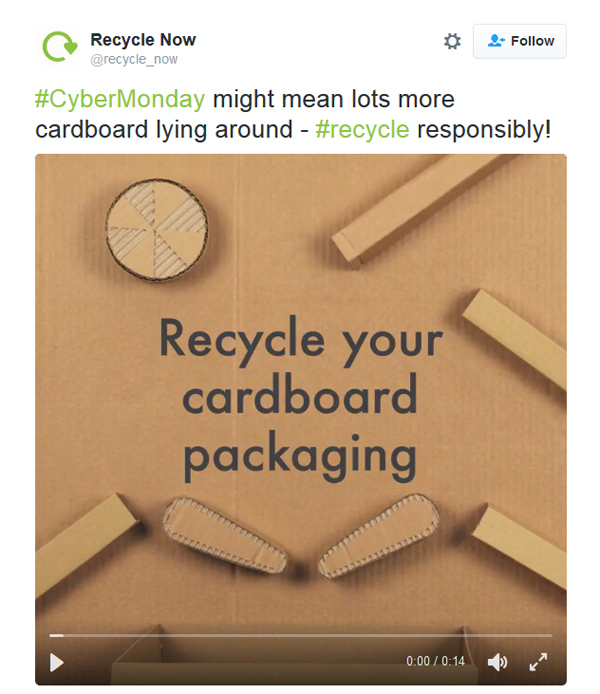 Recycling campaign Recycle Now used the opportunity to get creative with cardboard, posting an appealing pinball-themed video across their social media accounts. Digital music service Spotify’s latest ad campaign has had a lot of coverage in the trade press, and rightly so. 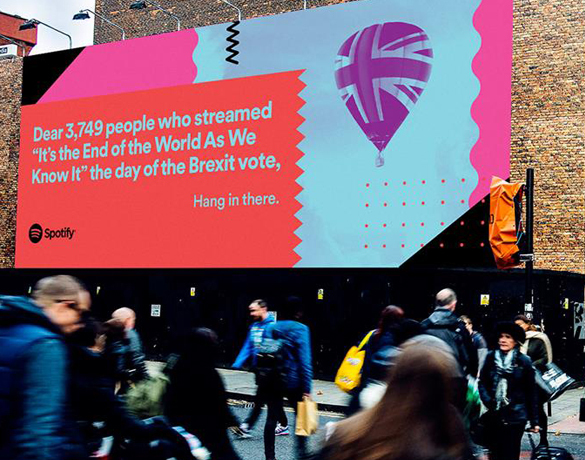 Unlike ebay’s blanket Black Friday campaign, they have tailored their advertising to each location, based on data from those particular customers. Paul Gill, Head of Digital Engagement for Oxfam, gave a fascinating talk at this month’s Optimise Oxford meetup, looking at digital engagement in emergencies. Oxfam uses a wide range of communication channels when running an emergency fundraising campaign, from organic and paid social media to emails and text messages. Each does a slightly different job, and some are better at driving donations than others. The approach is based on e-commerce: when you need to raise donations in a hurry, you think in terms of “conversion rates” and “return on investment”. But the thing that struck me most wasn’t actually about emergencies: it was a comment about Facebook. This social media channel, said Paul, helps the charity to reach the over-65s. (Oxfam even runs a Facebook advertising campaign about wills.) So tell that to anyone who says older people aren’t online. If Oxfam thinks it’s worth it, they are definitely there. I was walking home when I came across the most novel advert I’ve seen this month: a stencil on a pavement. It was on the premises of a local housing association, but the footpath is used as a shortcut by many local people. 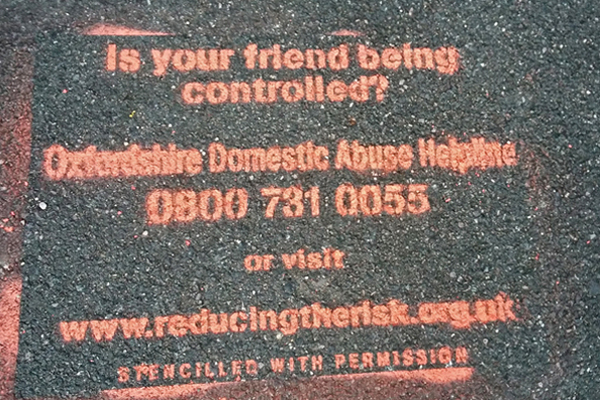 “Is your friend being controlled?” it asks, and then provides a phone number and a web address for the Oxfordshire Domestic Abuse Helpline. The last line is “Stencilled with permission”. A news programme is allowed to have a sense of humour. I loved Newsnight’s satirical take on the suggestion that the BBC should close the evening’s television with God Save The Queen.